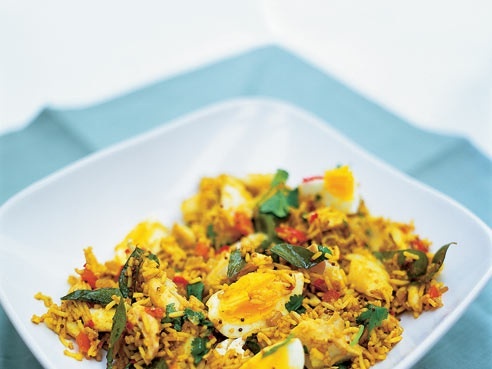 Although traditionally a breakfast dish, kedgeree makes a fantastic hearty dinner and a recipe using smoked fish is perfect over the festive period with the fishing boats generally not in use, you can guarantee the quality of a smoked fish. Give this recipe a go on Boxing Day! Boil the eggs for 10 minutes, then hold under cold running water. Put the fish and bay leaves in a shallow pan with enough water to cover. Bring to the boil, cover and simmer for about 5 minutes, until cooked through. Remove from pan and leave to cool. Remove the skin from fish, flake into chunks and set aside. Cook the rice in salted water for about 10 minutes and drain. Refresh in cold water, drain again, and leave in the fridge until needed. Melt some butter in a pan over a low heat. Add the ginger, onion and garlic. Soften for about 5 minutes, then add the curry powder and mustard seeds. Cook for a further few minutes, then add the chopped tomatoes and lemon juice. Quarter the eggs. Add the fish and rice to a pan and gently heat through. Add the eggs, most of the coriander and the chilli and stir gently. Place in a warm serving dish. Mix the rest of the coriander into the yoghurt and serve with the kedgeree.